If Ewan McGregor and Charley Boorman's Long Way Round has whetted your appetite for round-the-world biking mayhem, let the following video clips introduce you to Mondo Enduro. The series tells the stories of a 44,000 mile trip in 440 days - the longest possible land route in the shortest possible time. The team is just a bunch of average riders - rail workers, teachers and the like - taking on the challenge of the world's toughest roads on Suzuki enduro bikes. One rider gets run over by a truck in Africa. Another meets the girl he'll marry in South America. It's a cracking journey documented by the handheld cameras the lads took with them. See video clips below. There's now a follow-up: Terra Circa - in which five ordinary riders tackle the infamous Zilov gap on the Siberia/China border - never before crossed by bike. 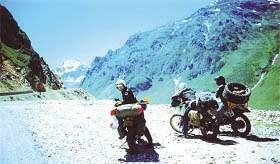 It's just part of their 20,000 mile unsupported ride from North London across Asia and America, ending in North America. See video clip below. Both are now available on DVD from www.aimimage.com at £26 each. Download clips, see below. Note: Some users may find it easier to right-click the videos and 'save target as' to their desktop to play.